Background: Only a few studies have carried out to evaluate the association of depression and anxiety with metabolic syndrome (MetS). The aim of this study was to investigate whether the depression and anxiety are associated with MetS and its different components. Materials and Methods: This cross-sectional study forms part of the prospective Isfahan Cohort Study. A total of 470 participants were chosen. Anxiety and depression symptoms were measured using hospital anxiety and depression scale (HADS). The MetS was diagnosed according to the American Heart Association and National Heart, Lung, and Blood Institute. One-way analysis of variance and binary logistic regression were used. Results: The mean age of participants was 55.7 ± 9.3. The prevalence of MetS in female participants with symptoms of depression (P < 0.0001), concurrent anxiety and depression (P = 0.004), anxiety (P < 0.0001), and asymptomatic individuals (P = 0.001) was significantly different when compared to male participants. Moreover, the analysis showed that having anxiety symptoms is in a negative relationship with MetS (odds ratio [OR] = 0.31; 95% confidence interval [CI] = 0.12–0.78). In addition, with each 10-year increase in age, the probability of MetS will decrease 40% (OR = 0.59; 95%Cl = 0.53–0.72). 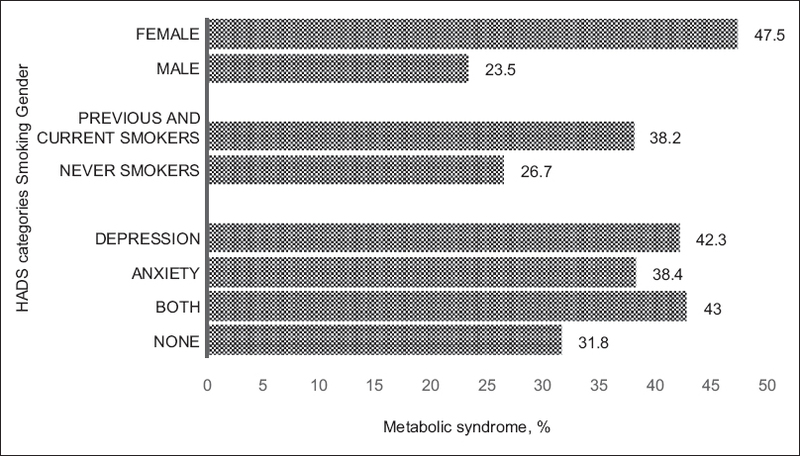 Body mass index (OR = 1.29; 95%CI = 1.21–1.37), and gender (higher age for women) (OR = 0.34; 95%CI = 0.11–0.98) had positive relationship with MetS. Conclusion: The study findings revealed that the prevalence of MetS in patients with anxiety was lower than the healthy subjects, while no significant association was found between depression, concurrent depression, an anxiety with MetS. Background: Rheumatoid arthritis is a chronic autoimmune disease characterized by synovial tissue inflammation and destruction of articular components which if not controlled properly, can cause disability in patients. For this reason, evaluation of disease activity and its control is very important. In recent years using sonography is promising for the evaluation of disease activity. This study aimed to compare “clinical examination” and “ultrasonography” methods in the detection of disease activity in patients with rheumatoid arthritis. Materials and Methods: This cross-sectional study was conducted during 2015 in Al-Zahra Hospital of Isfahan. Based on the American College of Rheumatology 2010 criteria, ninety patients with rheumatoid arthritis who diagnosed by rheumatologist entered into the study. All patients, collaborator by radiologists were subjected to sonography of specific joints structures using two methods, i.e., high-resolution ultrasonography and power Doppler. Results: A total of 2520 joints from ninety patients were examined by physical examination and ultrasonography that 244 joints (9.7%) in physical examination and 348 joints (13.4%) in ultrasonography were involved and the difference between the two groups was statistically significant (P < 0.001). Conclusion: Probably, ultrasonography can diagnose joint involvement better than physical examination in patients with Rheumatoid arthritis. Background: Research has shown that body mass index (BMI) does not take into consideration the gender and ethnicity. The primary purpose of this study was to examine the interaction effect of the BMI and age on fat-free mass (FFM), waist-to-hip ratio (WHR), and soft lean mass (SLM). The secondary purpose was to evaluate the practical significance of the findings by examining effect sizes. Materials and Methods: The study was comparative in nature and employed a factorial design. Due to nonexperimental nature of the investigation, no causal inferences were drawn. The nonprobability sample consisted of 19,356 adults. Analysis of the data included factorial analysis of variance, analysis of simple effects, calculation of mean difference effect sizes, and data transformation. The Statistical Package for the Social Sciences version 22 was employed for the purpose of data manipulation and analysis. 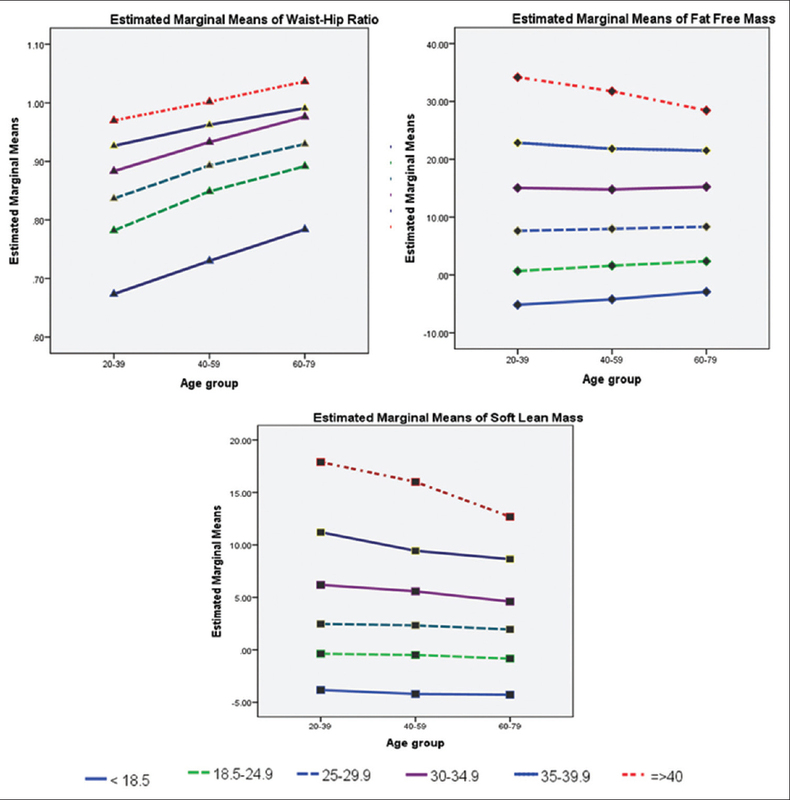 Results: The BMI by age interaction effects on FFM, F (10, 19,338) = 28.26, P < 0.01, on WHR, F (10, 19,338) = 18.46, P < 0.01, and on SLM, F (10, 19,338) = 14.65, P < 0.01, was statistically significant and ordinal in nature. Analysis of the effect sizes, ranging from 0.30 to 1.20, showed that the BMI and age influenced the WHR but their interaction effects on FFM and SLM, ranging from 0.04 to 0.36 and 0.03 to 0.33, respectively, were mainly negligible. Conclusion: Based on the examination of the statistical and practical significance of the results, it is concluded that the BMI and age together can influence the WHR but their interaction effect on the FFM and SLM is questionable. Background: This paper presents the objectives, research design, methodology, and primary findings of the Isfahan Comprehensive Elderly Study (ICES). Materials and Methods: In this cross-sectional study, 603 elderly persons (aged 60 and over) were selected by multistage cluster sampling method from Isfahan, Iran, in 2016 comprehensive questionnaires along with a detailed interview were used to collect information on personal, family, socioeconomic, health and social services characteristics, life styles, physical illnesses and chronic diseases, mental, emotional and cognition disorders, quality of life, disabilities, sleep quality, social supports, life satisfaction, self-efficacy, and of participants. Results: The mean ± standard deviation (SD) age of participants was 69.66 ± 6.31 years, consisting of 50.75% females. About 23% of elderly persons were at the risk of malnutrition and 4.5% were current smoker. Severe and mild depression were documented in 9.3% and 30.2% among included study subjects, respectively. About half of the participants had hypertension, and 26.8% suffered from cardiovascular disease. The mean ± SD of total score of Geriatric Depression Scale, Perceived Stress Scale, Older People's Quality of Life, Physical Activity Scale for the Elderly and Pittsburg Sleep Quality Index was 8.84 ± 6.79, 14.76 ± 5.92, 133.99 ± 10.55, 142.04 ± 120.53, and 6.17 ± 3.44, respectively. Elderly males had significantly higher life satisfaction and self-efficacy and better cognitive function than females (P < 0.01). Conclusion: The findings of current study provided a comprehensive overview of the current health status and lifestyle of older adults in Isfahan city. The ICES could help policy makers to design appropriate prevention and interventional programs and policies to cover the specific needs of the elderly population. Background: Good understanding of medication instructions is paramount to a good pharmaceutical care. The aim of our study was to examine the understandability of the selected three most applicable pictograms by participants and their recall after educational mini sessions. 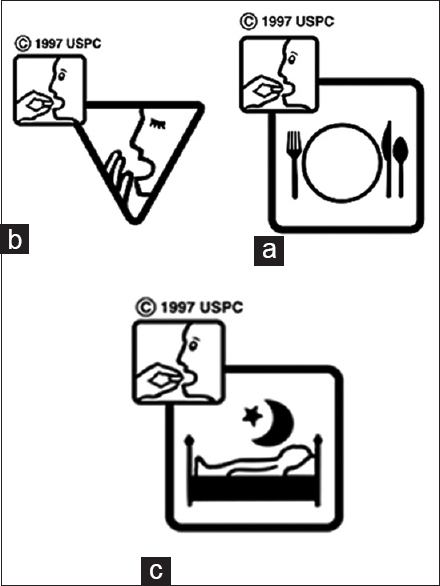 Materials and Methods: First, nine experienced pharmacists selected the three most potentially applicable pictograms. Pictograms A to C were determined, respectively, “A-take medication with food,” “B-medication may cause drowsiness,” and “C-take medication before sleep.” In the second phase, we measured the comprehensibility of pictograms by three groups of participants (sample of 358): highly educated participants of two major universities of Isfahan (Groups 1 and 2), low-literate and illiterate individuals (Groups 3 and 4), and the rest were participants interviewed in three teaching pharmacies affiliated to the Isfahan School of Pharmacy (Group 5). The American National Standards Institute (ANSI) and International Organization for Standardization (ISO) were used to compare the comprehensibility of pictograms. Furthermore, five qualitative questions were asked about the impact of pictograms on several parameters. Results: In the pre-follow-up period, only Group 1 (75%) understood pictogram A while pictogram B did not pass the ANSI and ISO thresholds for acceptability in none of the groups. In the pre-follow-up period, Groups 1 and 2 surpassed the ANSI threshold and Group 5 passed the ISO limit for C. In the post-follow-up period, C passed the ISO limit in Group 3. Regarding the qualitative questions, 84.1% believed that pictograms had positive impact on the correct use of medications and timing of administration. Conclusion: The groups with high level of literacy interpreted the pictograms better than those with lower levels of literacy. Chloroma, or granulocytic sarcoma, is a rare extramedullary solid hematologic cancer, found concomitant with acute myeloid leukemia. It is infrequently associated with other myeloproliferative disorders or chronic myelogenous leukemia. 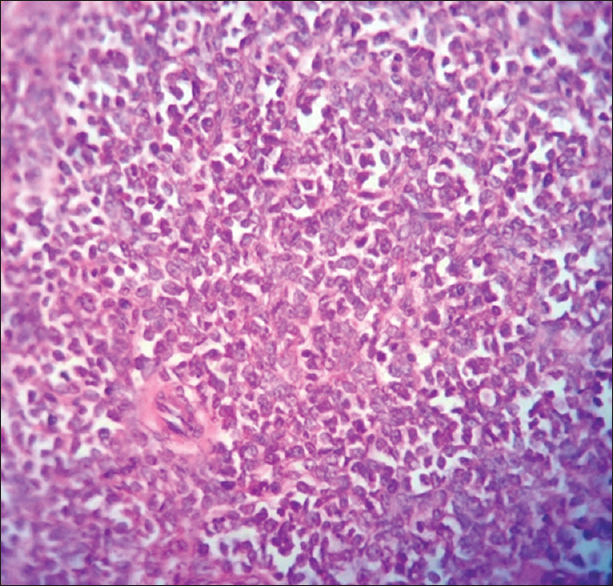 Chloroma of the testis after allogeneic bone marrow transplantation is particularly sparsely represented in the literature. It is suggested that an appropriate panel of marker studies be performed along with clinical correlation and circumspection to avoid misleading conclusions. We report an interesting case of a 32-year-old male with a clinical history of acute myelogenous leukemia, postallogeneic peripheral blood stem cell transplantation that was found to have chloroma of the right testis. Background: The aim of this study is to evaluate the results of photorefractive keratectomy (PRK) in the management of postoperative hyperopia and astigmatism in patients with history of radial keratotomy (RK). Materials and Methods: This prospective nonrandomized noncomparative interventional case series enrolled consecutive eyes treated with PRK after RK. In cases, in which (1) wavefront (WF) scan was undetectable during primary examinations; and/or, (2) WF data were not transferable to the excimer laser device, patients were treated with the tissue-saving (TS) mode. Patients with detectable/transferable WF were assigned to WF-guided advanced personalized treatment (APT). Results: Thirty-two and 47 eyes were managed by APT and TS modes, respectively. Pooled analysis of both APT and TS groups showed improvement in uncorrected distant visual acuity and corrected distant visual acuity. 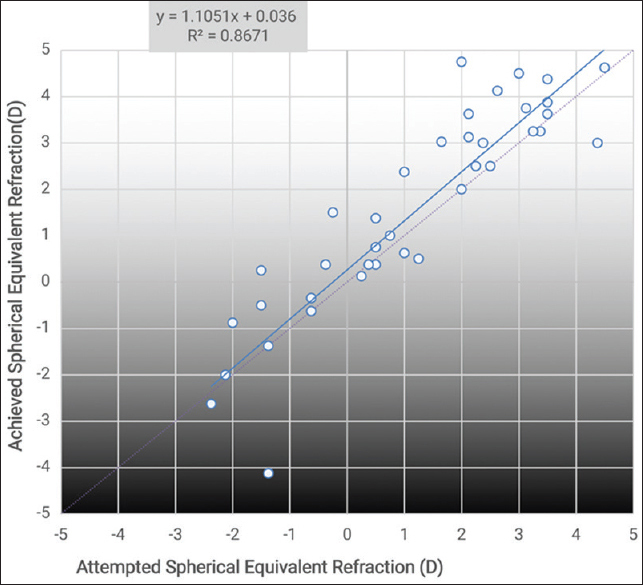 The amount of sphere, cylinder, corneal cylinder, spherical equivalent, defocus equivalent, and total aberration showed improvement as well. Conclusion: PRK seems to bring favorable outcome and safety profile in the management of post-RK hyperopia and astigmatism. It is crucial for practitioners to warn their patients about the fact that they may still have progressive refractive instability regardless of their choice on the laser method of vision correction.